Plant: annual or short-lived perennial herb, to 70 cm tall Leaves: opposite, sessile, entire, 2-9 cm long, 0.7-3.5 cm wide; basal leaves obovate; cauline leaves clasping, oblong to oblong elliptic INFLORESCENCE: flowers usually paniculate Flowers: pedicels to 7 cm long; calyx lobes to 25 mm long, 0.9-1.7 times as long as the corolla tube; corolla 2-3 cm long, white to lavender, the lobes oblong to obovate, to 20 mm long and twice as long as the tube; style ca 5 mm long; stigmas as wide as long Fruit: FRUITS ellipsoid capsules. SEEDS small, globose Misc: Wet, often alkaline or saline areas; 50-1000 m (200-3200 ft); Mar-Nov REFERENCES: Mason, Charles T. 1998 Gentianaceae. J. Ariz. - Nev. Acad. Sci. 30(2): 84. Duration: Annual Nativity: Native Lifeform: Forb/Herb General: Herbaceous annuals to perennials, to 1 m tall, stems erect and branching, herbage glabrous to glaucous. Leaves: Opposite, sessile, 2-10 cm long, 0.7-3.5 cm wide, basal leaves spatulate or obovate to oblong with obtuse tips, cauline leaves clasping, oblong to oblong elliptic with entire margins, the bluish-green leaf blades sometimes a little appressed and forming ranked V's as one moves up the stem, blades without stipules. Flowers: Pale to deep violet-blue, rose-violet, or white, the throats white with dark purple blotches, large and showy, corollas 2-4.5 cm long, with 5 elliptic or oblong to obovate lobes (petals) to 20 mm long with rounded or subacute tips, calyx 10-21 mm long, with lobes to 25 mm long, styles to 5 mm long, stigmas as wide as long, flowers borne in a pannicle or cyme or solitary at stem tips, pedicels 2-14 cm long. Fruits: Ellipsoid capsules. Seeds small, globose. Ecology: Found in wet, often alkaline or saline areas, in ditches and streambeds, from 150-3,500 ft (45-1067 m); flowering March-November. Distribution: Fairly common in the lower United States and found in the southwest in Arizona, California, Colorado, Nevada, New Mexico, and Texas, not known to occur in Utah. 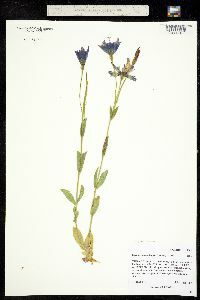 Notes: The lovely, large, lavender, sort-of poppy-looking flowers are striking, with white and darker purple rings or plotches around the throats, which hold exserted stamens and yellow anthers, the lightly clasping pairs of bluish-green leaves seem to be exultant, thus the scientific name of E. exaltatum. Look for this species in the western counties of Arizona; this species is known to occur in Mohave, La Paz, Yuma, Yavapai, Maricopa, Pima, Gila and Graham counties. This is the only species of this genus and is rare in Arizona according to Kearney and Peebles. Ethnobotany: Unknown. Synonyms: None Editor: LCrumbacher2012 Etymology: Eustoma comes from the Greek eu for "good or beautiful" and stoma for "mouth," the throat of the corolla tube being large, and exaltatum means very tall, lofty.